I'm always fascinated to find Easter Eggs hiding in brain. Little oddities that reiterate how little I really know about this crazy dance of life. While sitting at your desk, lift your right foot off the floor and make clockwise circles. 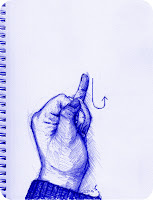 Now, while doing this draw the number "6" in the air with your right hand. Your foot will change direction. There's nothing you can do about it. I can't explain this one. Maybe somebody can. But doing so would ruin the magic. I say it is hard wired. A glitch left over from yesteryears.